I titled this post "A Perfect Mix" because that is what this style was for me personally. It encompassed all of my favorite prints, textures and colors into one; sequins, stripes, polka dots, metallic, a full midi skirt and of course basic black. Friday night we attended a gala benefiting Lone Star Paralysis. I was so honored and intrigued to learn more about this foundation, but got a little stressed about putting together another outfit for an evening event. I decided to shop my closet and styled a look that was dressy, but not over the top. We haven't attended this event before and was unsure what the attire was going to be. I went with my gut and decided that being overdressed was better than being under dressed. Next year I will tone it down a smidgen and go a little more conservative. You just never know until you go. My heart burst a dozen times over the course of the program. Hearing the stories, meeting the people that have been impacted by paralysis and learning more about the extensive research that is being conducted blew my mind. I felt convicted, motivated and inspired to get involved in being part of this foundation and making a difference in the lives of others. Their strength, optimism and perseverance through life altering obstacles brought tears to my eyes. It really put so many things into perspective and reminded me to not take simple things for granted; dressing myself, putting a fork into my mouth, taking a shower, driving to the grocery store and the list goes on for miles. There are numerous ways to help with Lone Star Paralysis. And if you don't live in Texas, I encourage you to seek out a similar foundation in your own city/state and help make a difference in others' lives. Take a moment today and pray, mediate, soul search; whatever gives you solitude to give thanks and remind yourself of all the simple everyday blessings that others wish they could get back. Here are a few other ways I have worn the Express full black midi skirt. This has become a definte staple in my closet. Get one before it's gone. Love that you shopped your closet - this is such a great outfit. And what a great post to expose a great organization! You look SO pretty Shanna! And every time I see this skirt on you, I am totally tempted to buy it! You look gorgeous, the heels are beautiful. Perfect outfit. Love that skirt! You did a great job mixing the pieces. The foundation sounds like a great cause! Absolutely gorgeous and I love your sassy side ponytail! Love that midi skirt on you. Perfect with the sequin top. Such a classic and sassy look! Love the sequins. I love this combo! You look absolutely stunning as always love! Ahhhhhhh. I LOVEEE this so, so, so much! I love that you went with sequins and a full skirt, so pretty! I think it's always better to be overdressed! It's the best feeling when you can shop your closet and save some money :) The sequins are so fun! This is such a fun "dress up" outfit! This top is is perfect compliment! I thought this was a dress at first! Either way it's gorgeous and the striped shoes are such a fun touch! I have a similar skirt from Asos, I wear it ALL the time! Loving that awesome side pony, gorgeous heels, and fun belt! You look fantastic! Well don't you just look stunning! Love your hair this way too, the side pony is such a cute look! I am all about this big midi skirt, it's absolutely beautiful! I need more colors! Great outfit! I love the sequins, the stripes. It looks great while managing to look effortless. 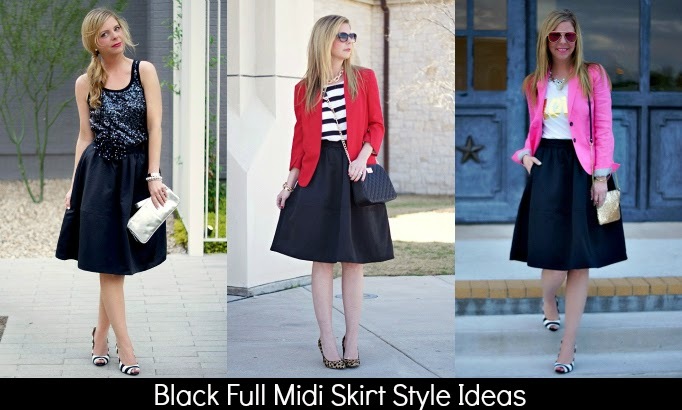 I've still yet to try a Midi skirt, but it is on my list! Love the way it looks with the sequins! Gorgeous as always, Shanna! that skirt is just so versatile, no wonder you wear it often, it looks fabulous! you look flawless! I am loving those shoes! That skirt is everywhere. Such a great staple! I love how you styled this skirt, no matter what you pair it with it looks great. You are really getting so much wear out of that midi-skirt - I LOVE it!! You pretty much look like a walking Kate Spade ad here :) Also, that sounds like such a great cause. It always hurts my heart to hear of the difficulties so many people are experiencing everyday, but knowing that there are people out there working so hard to make it better really makes my heart feel so full. Will definitely look into this project more! I'm with you - that skirt is so versatile & i'm so glad I got if after I saw it on you the first time! I love a good full skirt! So cute. What a wonderful foundation and the outfit you ended up choosing is beautiful! Dying over those shoes! And I always think that it's better to be a bit overdressed than underdressed! I love how you have remixed your black skirt into so many fabulous outfits!! Oh my goodness, this IS so perfect! I think I need to buy that skirt. Every time you wear it, I drool over it! Well I think you just convinced me I need a midi skirt finally. Love this look! Your social calendar is quite full these days! What a fun outfit, but not too out there since you kept it monochromatic. That sounds like a wonderful event, and you look glam and gorgeous! I love the flower at your waist--such a fun, whimsical touch! You look fantastic! This look is so so cute. Love the midi with the sequin crop top. And those shoes!! Love love it! You look so glamourous! Love how you styled pieces that were already in your closet! Such a pretty outfit. That skirt is so versatile. Gorgeous combination with the striped shoes. This post both cheered me up ( how can it not, that outfit!) and also made me take a moment to think how lucky we are to be able to carry out things we take for granted each day. Very inspiring! I am loving full midi skirts this spring! Asos has great ones in a whole bunch of colors.